Whether it’s a temporary leave, a one off limited edition or production has simply ended; Hummels go into retirement as apposed to being discontinued. This means that they may return for a special occasion under a new Hum number extension. First modeled in 1948 by master sculptor Reinhold Unger. Originaly made as 3.75″-4″ figurines. More sizes were released in the mid 1950’s, 5.50″ and 5.75″-6″. With the larger 195/I (5.75″-6″) being put into retirement in January of 1999. Hummel Figurines are showcased in many antique collectors cabinets. These porcelain figurines, based upon drawings by Sister Maria Innocentia Hummel, first became popular towards the end of the second world war. These porcelain ornaments were often gifted by soldiers in Germany to family back home in America. 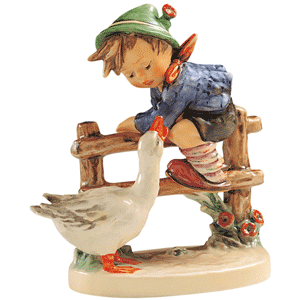 Although not an overly expensive item during this time, in today’s society Hummel Figurines have become greatly sort after antiques by keen collectors leading to a large price increase. 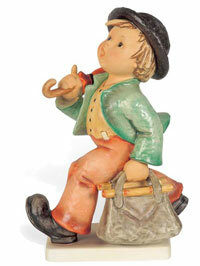 One of the most popular Hummel Figurines in a collectors cabinet is the ‘Merry Wanderer’. This porcelain figurine depicts a young traveller walking with a spring in his step (merrily walking) with a red umbrella and luggage bag. Garden furniture, also called patio furniture and outdoor furniture, is a type of furniture specifically designed for outdoor use. It is typically made of weather-resistant materials. 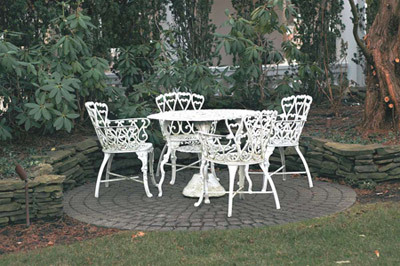 The oldest surviving examples of garden furniture were found in the gardens of Pompeii. Glass-blowing is a glass-forming technique that involves inflating molten glass into a bubble, or parison, with the aid of a blowpipe, or blow-tube. A person who blows glass is called a glassblower, glassmith, or gaffer. 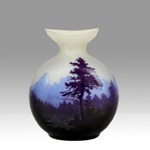 Antique Emile Galle Vases are original glass vases produced by the notable artist and designer Emile Galle.Emile Galle (born 8th May 1846) was a French Art Nouveau artist who worked primarily with glass.He first learned his techniques after studying philosophy and taking on work at his father’s furniture factory. This is a continuation of antique furniture price guide. Here are the previous guides for this series. Antique furniture is collectible interior furnishings of considerable age. Often its age, rarity, condition, utility, or other unique features makes a piece of furniture desirable as a collectors’ item, and thus termed an “antique”.